“It was a divisional game, so it was huge for us to get out here and come to a hostile place with a team playing great football. It was a good one for us. A good test.” — Ben, post-game. Ben completed 21 of 33 passes for 245 yards with a 16-yard touchdown pass to Jerricho Cotchery. Running back Rashard Mendenhall added two short touchdown runs, while Shaun Suisham kicked a 39-yard field goal for the other points. It was Rashard Mendenhall who scored the go-ahead touchdown late in the third quarter. He carried the ball 16 times for 44 yards. Pittsburgh’s defense came up with two interceptions in the fourth to claim a 24-17 victory over the Cincinnati Bengals in a key AFC North battle. “It was really windy. That’s the only reason I went with the glove, because you can spin it a little better. It definitely affected some throws, but you know me, I’ll never make excuses.” — Ben, when asked about wind conditions affecting his throws. Mike Wallace caught six passes for 54 yards and carried the ball two times for 31 yards. Andy Dalton connected on 15-of-30 passes for 170 yards, two touchdowns and two interceptions for Cincinnati (6-3), which had a five-game winning streak snapped. “That was kind of the mentality — ‘Let’s go no-huddle and try and get down there. Let’s answer.’ We take pride as an offense in wanting to be the best. It’s our time to do it, so let’s step up and score. We always want to answer. If I remember right, it was a pretty long drive, converting third downs. That’s huge. It gives our defense a break, wears their defense down, and when you score at the end of it, then it’s good.” — Ben, on the decision to go no-huddle late in the third quarter. With the score tied at 17-17 midway through the third quarter, the Steelers put together an 11-play, 81-yard scoring drive. Jerricho Cotchery got the march going with a 13-yard catch. Antonio Brown caught a 12-yard pass a few plays later to put the ball at the Cincinnati 40. Isaac Redman followed with an 11-yard run before Wallace added a 12-yard catch to put the ball at the nine. Mendenhall then broke through a leg tackle and rumbled into the end zone for a 24-17 lead with 1:55 to go. Lawrence Timmons picked off Dalton early in the fourth. The Steelers took over at their own 33, but were forced to punt. After two more punts, the Bengals took over near midfield with 4:28 left. Cincinnati used the ground game to get to the 25, but William Gay came up with a huge interception. The Steelers kept the ball for the final 2:27 for the victory. “It’s perfect timing for guys that are banged up. We’ll get some guys back. Guys that just have nicks here and there will get rested up. It’s a good time for us. You definitely want to have this long time off after a win. When you go into it with a loss, you are ready to play again. For us, it’s a good time.” — Ben, on the upcoming bye week. The Steelers have their bye next Sunday before heading to Kansas City for a night game on NBC. They have off next Thursday through Sunday, and Coach Tomlin will not conduct a press conference Tuesday. They will return to practice the following Monday, a week from tomorrow. You can see video of game highlights here, game photos here. You can read more from Ben’s post-game press conference here. Gay never admitted to seeing that attempted pass from quarterback Andy Dalton to wide receiver Jerome Simpson coming. But apparently quarterback Byron Leftwich did. 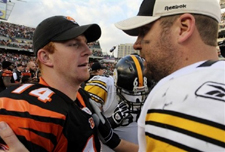 – Ben is 8-1 at Paul Brown Stadium (7-1 regular season and 1-0 in the playoffs) in his career. – The Steelers hold a 50-32 lead in their overall regular-season series with Cincinnati. – Mike Tomlin is the fourth coach in Steelers history to win 50 regular-season games, joining Chuck Noll (193), Bill Cowher (149) and Buddy Parker (51).